The US dollar was off by nearly one percent against a basket of currencies on Tuesday. The benchmark index which measures the value of the greenback against six major trading currencies dropped to 97.4 reversing a six day rally. The greenback was broadly weaker on most of its pairs with the exception of cable (the British pound). With both the dollar and the UK pound well bid in anticipation of interest rate rises there was a lack of impetus for further upward momentum on both currencies. With many institutional traders now viewing both as fully priced scope for immediate upside would seem limited. EUR/USD rallied strongly up to 1.0952. Resistance is likely towards the 50% retracement level which lies around 1.0966. The reason for the move in EUR/USD was not euro strength but rather dollar weakness. The pullback is likely technical and due to traders booking profits ahead of pending interest rate decisions by both the Fed and the Bank of England. Debt yields held firm across the curve indicating that markets are not adjusting their outlook on the path of interest rates at the moment. Risk was back in focus over the session as metals and commodities staged a modest rebound during the Asian session. This added to the draw of funds away from the greenback. Gold lifted to $1106, while other industrial and precious metals were broadly higher. 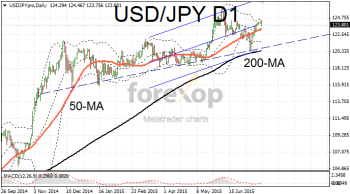 USD/JPY suffered a heavy bout of selling pressure which took the rate down to 123.79. The move took the level down 0.5% from the day’s high. The next key support for USD/JPY is around 123.3 which will align with 200-day moving average. Although in an extreme scenario the rate could break down to the upper 120 area. Next week’s meeting of the Federal Reserve will be closely watched and is expected to create some excessive volatility.